Navel orangeworm is the key pest in almond. Nut feeding by this pest directly reduces yield and grower income. For example, 1% damage* in a 2500 kernel lb/acre crop = 25 kernel lb/acre loss (and $62.5/acre at a price of $2.50/lb). Also, NOW damage is frequently contaminated with highly toxic fungus aflatoxin, which is carried by the pest. Certain major almond markets have an extremely low tolerance for aflatoxin. What should growers think about when planning for NOW management at hull split and harvest, particularly when egg and/or pheromone traps are largely empty in the spring? NOW adults can fly a quarter of a mile. When hull splits starts in your orchard, your nuts can become vulnerable to moths from your neighbor’s orchard, if they are a quarter of a mile away, or less. Time your hull split spray(s) based on crop sensitivity (hull split), not trap counts – especially in low pressure years. When NOW pressures are low, egg traps don’t always attract females for egg laying when flights begin – especially when there are thousands of splitting real nuts as competition. Harvest at 100% hull split. Shake your trees once the nuts have reached 100% hull split. NOW populations build with every generation (see graph below) and NOW females lay fewer eggs on harvested nuts than those nuts still in the trees. So get the nuts on the ground as soon as they are ready. 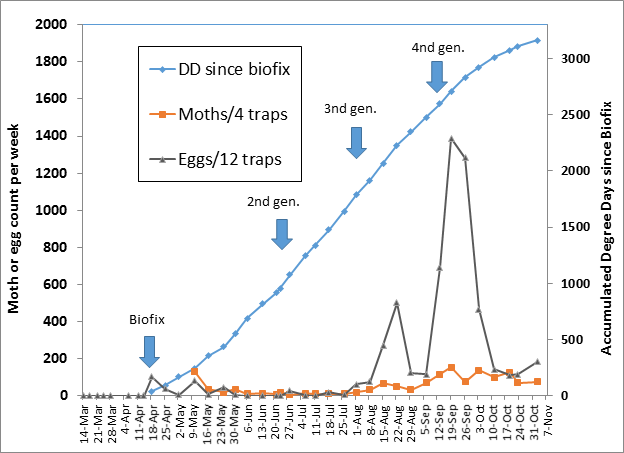 Navel orangeworm egg trap and pheromone lure catches over time, plus Degree Day (DD) accumulation and NOW generation (gen.) timings in Colusa County, 2016. If you spray, spray early. Newer, soft pesticides used for NOW control last a long time and work well on eggs and small worms. Research by Dr. Frank Zalom, UC Davis Entomology Department, suggests that effective pesticide residual is in this order (roughly): Intrepid® 4 weeks > Altacor® 3 weeks > pyrethroids (Brigade®, etc.) 2 weeks. Consult with your PCA and consider spraying early, so eggs are laid on treated surfaces. This may mean starting to spray as blanks are beginning to split – depending on how long it takes you to get across the orchard. Why spray early when pressure is low? The longer you can keep the NOW population low, the lower the pressure will be later in the season when pollinators (Monterey, etc.) are splitting. Spray carefully. Field research results from Dr. Joel Siegel (USDA) and Ken Giles (UC Davis) have repeatedly shown that slower sprayer ground speed (2 MPH) and higher spray volume (150-200 gpa vs 100 gpa) delivers the best possible NOW control. Also, spraying when the humidity is higher (roughly 10 PM to 10 AM) means less spray evaporation and better coverage. Need to move faster? Consider using an additional sprayer instead of driving too fast and getting less control (lease/borrow?). If better spray timing could reduce damage by 0.5% (0.25% on your grade sheets*) in a 2500 kernel lb/acre orchard, that’s $31.25/acre/year back in your pocket before any quality incentives. *Because many damaged nuts are lost through the blower at pickup, 1% actual damage in the field will show up as 0.5% damage on reject sheets from your processor. So 1% damage on your reject sheet is probably 2% damage in the field.